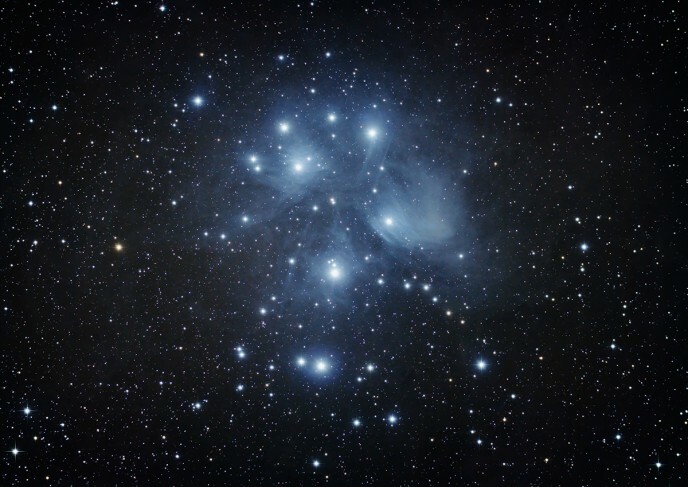 The Pleiades is a gorgeous open star cluster in the constellation Taurus. 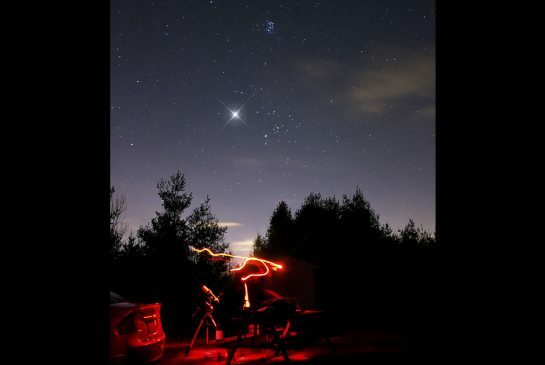 In the Northern Hemisphere, it is a fall-winter astrophotography target. Messier 45 is a well-known object by fans of the night sky, as the “Seven Sisters” are a stand-out visual delight among a sea of stars. You’ll find this striking cluster of 7 stars within the constellation Taurus. 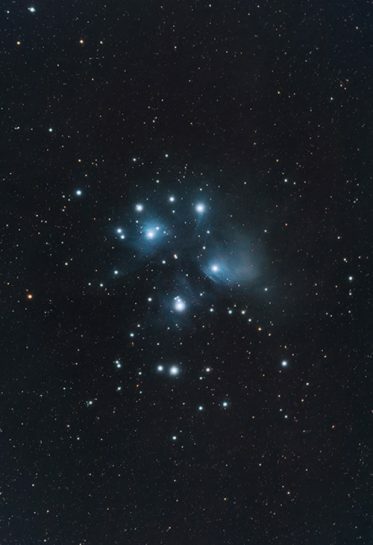 On top of being an open star cluster, the Pleiades also contains faint reflection nebulosity, that can be seen through long exposure astrophotography. In the following post, I’ll share my best advice for photographing this open star cluster using a DSLR camera and lens or telescope. 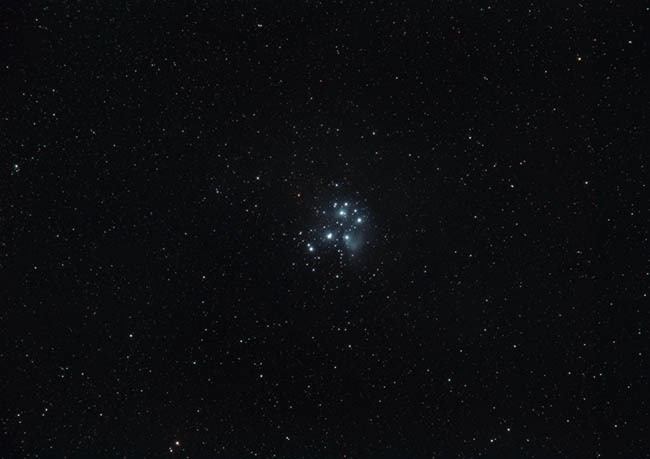 An interesting point to note, is that a stock DSLR camera is capable of producing incredible images of this cluster. Reflection nebulae in general do not require a modified DSLR camera to record effectively. 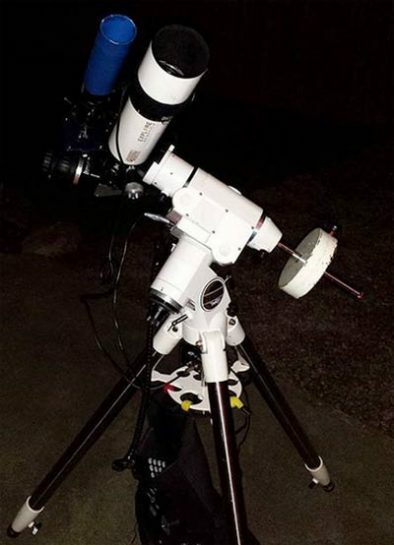 The Explore Scientific ED80 telescope tracked the apparent movement of the night sky on a Celestron Advanced Series CG-5 GoTo computerized mount. The use of an Orion autoguiding system helped me capture the 3.5-minute long exposures accurately. The photo you see above was captured on a cool night in September 2012 using my 80mm Explore Scientific Refractor, and a Celestron CG-5 equatorial mount. By stacking multiple exposures (38) I was able to increase the signal-to-noise ratio of the image. This helps bring out the faint reflection nebula that envelope the bright blue stars. 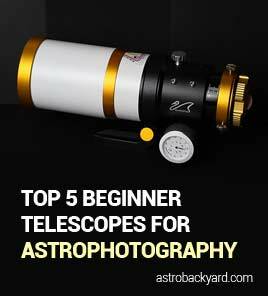 This telescope is on my list of best beginner astrophotography telescopes. Apochromatic refractors are an excellent choice for astrophotography, especially for those transitioning from a camera lens to a telescope. For this target, the biggest advantage you can give yourself is to shoot under dark skies away from city light pollution. You’ll want to use manual mode on your camera, and set the camera dial to bulb mode to collect ultra-long exposures of at least 2-minutes each or more. Longer exposures will begin to reveal the faint outer nebulosity and dust surroundiong the star cluster. By shooting your image in RAW format, the white-balance setting you choose is irrelivant, as you can change this later in post processing. However, I usually leave the white balance set to auto or daylight for all of my astrophotography images as a starting point. To focus the star cluster using a DSLR in both a camera lens and/or telescope, I recommend using the live-view feature on your camera. You can then zoom-in to 10X to make fine adjustments to the focus until the bright stars are as sharp as possible. A light pollution filter can help to isolate this deep sky objects from a washed out city sky, but there is no subsitute for dark skies. For M45 in particular, you will benefit from taking your image from dark sky site during the new moon phase. As an example, have a look an the unprocessed single frame vs. a color balanced version. This photo was captured using a DSLR and camera lens from my Bortle Class 8 backyard in the heart of the city. The lens used was a Canon EF 24-105mm F4/L at it’s maximum focal length of 105mm. There is a massive amount of dust within the Pleiades star cluster and can be captured in detail with enough exposure time. This 12-hour exposure displays just how much dust there really is surrounding the Pleiades star cluster. The photo below shows the Pleiades using a Camera Lens with a focal length of 105mm. This is a great example of a mid-range shot that begins to show the reflection nebulosity surround the cluster. The lens used was a Canon EF 24-105mm F/4L, that was attached to my Canon EOS Rebel T3i camera. The camera and lens tracked the sky courtesy of the iOptron SkyTracker camera mount. The exposures were 2 minutes each, with 70 frames in total being used. Because this image was captured from my backyard, a light pollution filter was used to help create contrast between the object and the washed-out night sky. One of the benefits of shooting Pleiades with a DSLR camera is the ability to focus using the bright stars of M45. Unlike many faint nebulae and globular clusters in the night sky, Pleiades is easy to find and shows up well in your camera’s live view screen. It’s also very easy to locate and frame on your DSLR display screen. The mojority of the deep sky objects I photograph are far too dim to identify through a camera lens with my DSLR. Thankfully, Pleiades is an exception to this, which is why it is such a popular deep sky target for beginners. A wide-field instrument such as the 480mm Explore Scientific ED80 that I used is needed to capture the entire star cluster. With a crop-sensor DSLR (APS-C), a larger telescope with a focal length of 800mm or larger will capture more detail in the reflection nebulosity, but crop the full view of the star cluster. A full-frame DSLR camera will collect a wider area of sky at once, and that can be beneficial for targets like M45 and many more. You can calculate the field of view for your particular astrophgtography equipment by using this handy field of view calculater. A full frame DSLR camera and a wide field telescope is a great combination to use when photographing this star cluster. The image below was captured using a stock Canon 5D Mk II and a William Optics Zenithstar 73. The challenge when processing Messier 45 is the extremely bright and large stars in the image. These stars may have caused some odd reflections in your image, that will be to be removed using either the clone tool or healing brush. The Content-aware fill feature in Adobe Photoshop will also handle the task quite well. The image processing steps needed for an image of a star cluster are quite different than they are for a galaxy or nebula. Because the focus is on the stars themselves, less stretching (curves, levels) of the data is needed. For most of my deep-sky images, my goal is to tame the bright stars and pull the light from the DSO (deep-sky object) forward. The Pleiades is a challenge because the stars and reflection nebulae are featured together. This is why you will see so many variations of M45 with fluctuating amounts of nebulosity. Binoculars are a great tool for observing the Pleiades, as this star cluster is quite large and impressive. A wide field of view will ensure that the entire cluster of 7 stars can be seen at the same time. The first time I noticed the Pleiades was back in 2010 from my backyard. 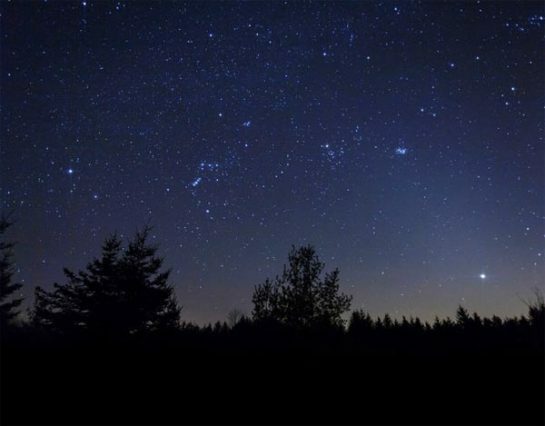 I had just purchased my first telescope (An Orion 4.5″ SkyQuest Dobsonian) and noticed a peculiar glowing region of the sky rising in the East. I pointed my little reflector towards the object – and BAM! The glowing region was the most intense open star cluster I had ever seen. I thought to myself, “I think I’ve found something here”. 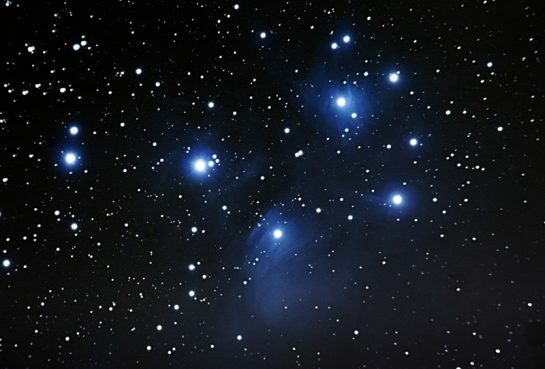 Naturally, I later found out that the Pleiades are indeed a well recognized and enjoyed group of stars in the night sky. M45 is a trendous deep sky astrophotography target, no matter what photography equipment you’re using. I hope that my experiences photographing the Pleiades over the years has inspired you to tak your own shot. For the latest information and photos, please follow AstroBackyard on Facebook.